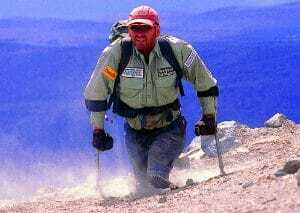 Keynote speaker Warren Macdonald is a mountaineer, redefining the known limits for amputees. Warren was the first double above-knee amputee to reach the summit of Africa’s tallest mountain Mt Kilimanjaro. Warren Macdonald is an impressive speaker, he gives honest and authentic talks about the importance of the mindset, resilience and patient care. 1997, was a fateful year for keynote speaker and adventurer Warren Macdonald. His accident on North Queensland’s (Australia) Hinchinbrook Island while climbing to the Island’s tallest peak should redefine his life boundaries. Warren Macdonald became trapped beneath a one-ton slab boulder in a freak rock fall. Two days later he was rescued, only to undergo the amputation of both legs at the mid thigh. Warren Macdonald did not let his fate break his will for adventure. In less than a year after the accident, he climbed the Tasmanian Cradle Mountain using a modified wheelchair and the seat of his pants. The climb of Mt Kilimanjaro followed in 2003 and after that the unbelievable effort of the ascent of America’s tallest cliff face, El Capitan. Warren Macdonald published his lessons of life in the Australian bestseller “A Test of Will” and was featured in an episode of the Discovery Channel series “I Shouldn’t Be Alive”. Another documentary, “The Second Step”, treats the epic four-week journey to Federation Peak, Australia’s most challenging mountain summit. When giving talks, Warren Macdonald works effectively and successfully with teams outside and within the healthcare sector. He empowers, engages and inspires. By taking his life story as an example, Warren Macdonald is able to infect teams with a mindset of, as he calls it, “Bring it!”. 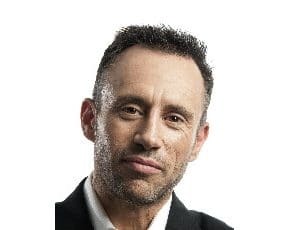 Warren is a keynote speaker who pushes boundaries and helps you to make the impossible possible. If your team or your members can’t see where you’re going, what are the chances they’ll get on-board? An understanding of the incredible importance of mindset, and how perception is the most important factor when it comes to limiting, or improving, our performance. Specific tools and techniques to help break through the barriers that limit us. How to develop strategies to counter inevitable setbacks that always come when pursuing big goals. If there’s one certainty, in business and in life, it’s that we will all face challenges; that we will all, at some point be faced with a seeming insurmountable obstacle or obstacles. When that happens, it pays to have banked some resilience. This keynote presentation focuses on what we can do to prepare for our challenges in advance. An understanding of how resilience is banked, and is transferable across all areas of our lives. Specific tools and techniques to build resilience. Learn that “Bouncing Back” is just the beginning. By practicing resilience, we position ourselves to Bounce Forward towards our goals. Ten days in intensive care; a month in the first hospital, then seven months of rehabilitation; learning how to live as a double above knee amputee, Warren know that what caregivers do to make a difference. Validation of the importance for the role you play. You make a difference! Strategies to improve the quality of care you deliver. The importance of perception in your role in healthcare, both in how you see your patients and how you see yourself. We’ve all heard it a million times; “change is constant”, “the only certainty in life is change”, “change or perish”. We all know it; what we need is for someone to show us how to deal with it. Warren’s “Challenge of Change” presentation will help your group realize that challenges brought on by change hold endless opportunities for innovation and personal and professional growth. You can get a sneak peek of the presentation here. Foster the ability to recognize and breakthrough mental barriers to change. Tools to build resilience for both business and personal growth. Develop a breakthrough mindset that seeks solutions and opportunities. It’s all well and good to set seemingly impossible goals; the kind that has your team looking at you like you’re nuts. Like this time you’ve really lost it . . . You need them to see what you see. You need to convince them, to inspire your team to follow you.